Imagine you notice the ocean swell with faster wave frequency, increased wind speeds, and the gradual increase of rainfall. Over the next couple of days, you prepare for the worst by boarding up windows, stocking up on food, and finalizing a potential evacuation plan. There might be a terrible storm, but it could just as easily blow over. What matters is whether you are prepared. We can apply this metaphor to business financing. When the business or stock markets dip, stay steady, or suffer a major crash, you want to continue running your business. According to reports and trends, the financial forecast of 2017 may include another stock market crash. While the accuracy of these predictions is debatable, it doesn’t hurt to make fiscal preparations in the event a market hurricane reaches landfall. Since 2009, the stock market has experienced a bull market. Seven years later, the market may experience a correction (or drop). In August 2016, the Standard & Poor’s 500 Index, the Dow Jones Industrial Average, and Nasdaq Composite reached record highs. And not just all-time highs, but all-time highs on the same day. With invoice factoring, you will get the money your business worked to earn, regardless of those peaks and valleys. Since the first quarter of 2015, U.S. economic growth has decreased each quarter. The U.S. Labor Department found second quarter plummeting productivity at an annual rate of 0.5 percent Also, in September 2016, the U.S. Federal Reserve corrected its June GDP prediction for 2016 from 2 percent to 1.8 percent, respectively. Global growth is based on many factors, therefore business owners should always be aware of the potential effects to their business’ bottom line. The Q ratio is a popular method of estimating the fair value of the stock market developed by Nobel Laureate James Tobin. The Q ratio suggests the collective stock market value should equal its replacement costs. It is measured by summing the entire stock market price and dividing it by its replacement cost. It is currently at 52%. A Q ratio higher than 40% is alarming. Also, every past stock market crash, except one, has occurred after the Q ratio reached the mid-50s. Those who are watching the market are concerned about this, but as long as your financial storm windows are in place, you know that your business has an extra layer of protection against the storm. For businesses that depend on lending, market volatility can be a concern because capital sources could suddenly become unavailable; fortunately, those concerns can be less of a crisis with invoice factoring. Invoice factoring can help your business stay standing through the flood waters of financial crisis by helping your company maintain a steady cash flow or, in some instances, helping build a cash reserve. The qualification process of invoice factoring only takes a few days. Once approved, you’ll receive funds usually within 24 hours. Invoice factoring can bring an end to the burden of waiting on payment. 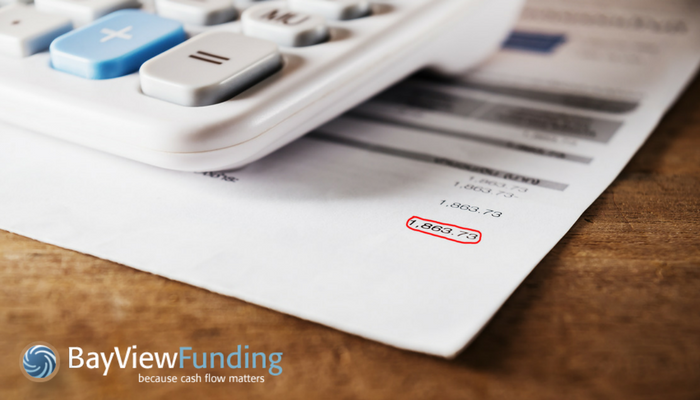 If you have questions about invoice factoring or would like to speak with an agent, don’t hesitate to contact Bay View Funding today.